BMT Sea Beach Line at New Utrecht Avenue. R-46 train on an R put-in service. Photo by: Zach Summer, October 2011. The Sea Beach Line began service on July 18th, 1877 as a steam railroad called the New York and Sea Beach between the 64th Street pier and Bath junction (approximately where 62nd Street & New Utrecht Avenue intersect today). In 1879, the steam line reached the Sea Beach Palace Hotel in Coney Island and terminated at Sea Beach depot, located between the West End and Culver depots. The current stations are placed on the sites of the old New York & Sea Beach ones but were given from the start street names. The railroad stops had place names like Bath Junction, Woodlawn, Hubbard Creek, and so on. Some of these names are preserved in the names of businesses around the stations. In 1896, the railroad was reorganized into the Sea Beach Railway Company. In 1898, the line was electrified with trolley wire and in 1903, the BRT began through service between Bath Junction and Coney Island. This was done by coupling and uncoupling Sea Beach cars to/from 5th Avenue - West End trains at Bath Junction. Trolleys ran west of Bath Junction to the pier and later to a ramp near 3rd Avenue. In 1910, Sea Beach trains began terminating at West End depot. Between 1913 and 1915 as part of the Dual Contracts, the Sea Beach line as we know it today was built between Coney Island and the 4th Avenue Subway at 59th Street. This was looked upon as a significant line because the Sea Beach would provide passengers with the fastest express route to Manhattan then available in New York City. Also, the BRT planned on debuting the 67' Standard subway cars on this line when it opened. The 4 track Sea Beach route, virtually all open cut, had no express stops between Coney Island and 59th Street. In 1913, the junction with the West End Line at Bath Junction was broken, because the new Sea Beach line under construction passed directly underneath. 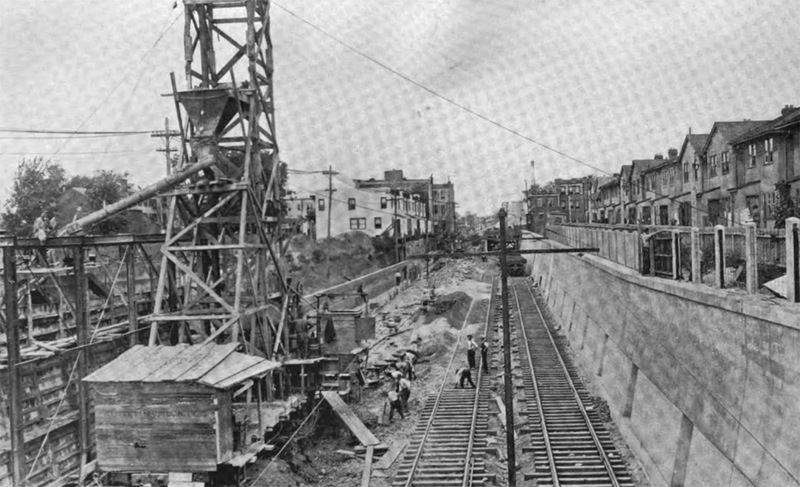 During construction, service was provided using a mix of trolleys, buses and even single subway cars. The new Sea Beach Line began revenue service in 1915 and connected into the 4th Avenue subway and Manhattan Bridge to Chambers Street. This was the first subway service made available in the 4th Avenue subway and the first on the Manhattan Bridge. Sea Beach trains began using the new Stillwell Avenue - Coney Island terminal on May 30th, 1919. Sea Beach trains ran as far north as Union Square in 1917, and then to Times Square in 1918. It should be noted that the tracks on the Manhattan Bridge were ready for service shortly after the bridge's opening day (December 31st, 1909). However, they were not connected to any tunnel routes on either side of the bridge, because none existed! In 1912, the Manhattan Bridge Three Cent Line, a trolley company, began running trolleys over the subway tracks on a temporary basis until 1915, when the trolleys were moved to the upper roadways and the BRT subway opened. The trolleys ran over the Manhattan Bridge until 1929, when the auto won out over the streetcar. Starting in 1915 and lasting into 1951, "sunny summer Sunday" expresses ran from Chambers Street over the Manhattan Bridge, the 4th Avenue subway and the Sea Beach Line to Coney Island. Trains ran express from 59th Street to Coney Island. The Brighton Line also had a similar type of run, leaving Franklin Avenue to Prospect Park and then running express to Brighton Beach. In 1967, the "NX" express from Brighton Beach to 57th St - 7th Ave made its debut. It started in Brighton Beach and made all stops to Stillwell Avenue. For the NX service the Sea Beach express tracks were completely rebuilt, the first and only major fixup of these tracks. Once at 59th Street it made limited express stops to its Manhattan terminus via the 4th Avenue subway, Manhattan Bridge and Broadway subway. There were only three or four runs in each rush hour. It was discontinued in 1968 because of lack of ridership, probably because it wasn't as fast as one might have thought. North of Stillwell Avenue station, a two-track bridge hopped over Coney Island Creek and was used by West End, regular Sea Beach, and yard trains. This was a major point of congestion on the line. In the 1970s a separate creek crossing, about 20m east of the original one, was built to segregate West End trains from the Sea Beach trains but it was too late for the NX. Other than the two above services and the rare reroute of trains due to track work, the Sea Beach express tracks were not used in revenue service. They were used to test new equipment and to store laid up trains. Over the years, the express tracks between Kings Highway and 8th Avenue have fallen into neglect. In 1998 track E3 (downtown express) was removed between 8th Avenue and near Kings Highway stations. The remaining express track will have reverse signalling for a possible 'third track' service. The full four tracks are kept from Kings Highway to 86th Street, which the NYCT still uses to test new equipment. Upon leaving the 4th Avenue subway at 59th Street, the Sea Beach Line starts somewhat below grade but is not really an open cut until after 8th Avenue. 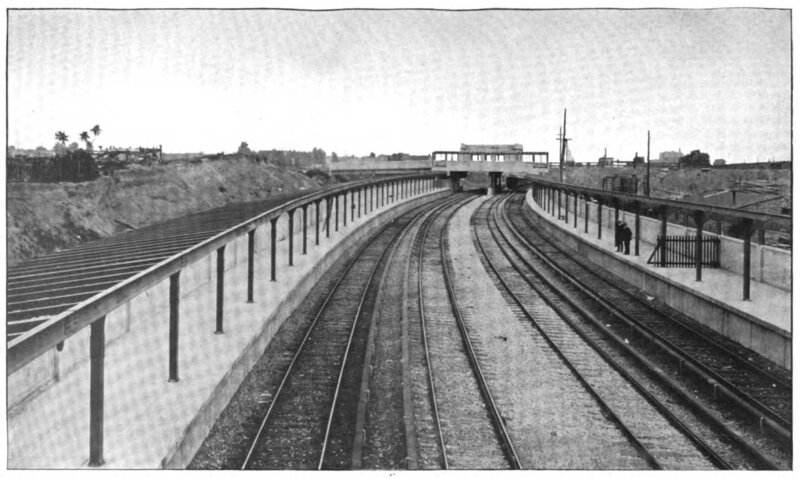 Upon passing Ft Hamilton Pkwy station, the line resembles the open cut built for the Brighton Line between Church Avenue and Prospect Park. It remains that way until 86th Street, where the Sea Beach Line is reduced from a 4 track railway to 2 tracks, and they slice the Coney Island Yard diagonally. Then the line crosses Coney Island Creek and rises again before entering Stillwell Avenue. All stations in the open cut are local stations with platforms sitting on the outside of the line built into the sides of the open cut. 8th Avenue is somewhat built on top of the LIRR Bay Ridge branch and looks more like a side elevated station than an open cut station. The Sea Beach stations are overly long for a BMT line. The full length train swims in them. The typical platform length is 650-700 ft., whereas the trains are no longer than 600 ft. Despite the fixup on the entire line in the 1980s the station houses are pretty shabby. Expect to see a tired uninviting entry hall. The 2005 capital plan announcement includes some Sea Beach station renovations. Sea Beach Line. 19th Avenue, concrete mixing and placing. Finished retaining wall and reinforced concrete fence. PSC report 1914. Sea Beach Line. Looking South from Seventh Avenue Station. 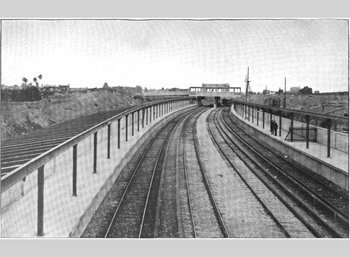 [8th Avenue Station] PSC Report 1915. Other than Stillwell Avenue, the Sea Beach Line doesn't have much going for it in terms of photo opportunities. As far as a ride from the head end goes, it falls somewhere between a ride on a true elevated and a ride underground. If done at night, there's really nothing to see at all. Going for it however is the run through the Coney Island yards, but even that over the years has had some of its glimmer taken away, as car washes now sit directly next to the tracks, impeding the view of the yards themselves. There is a photo op at the Eighth Avenue station from the crossover at the Seventh Avenue end. Other ops are at the road crossings of the line at every avenue. However, in some places, due to recent rebuilding of the LIRR overpasses, the new crash walls are too high too see over. 1877: Opened as the New York and Sea Beach Railroad. 1896: Reorganized into the Sea Beach Railroad Company. 1912: Merged with the Brooklyn Union Elevated Railroad Company and the Canarsie Railroad to form the New York Consolidated Railroad of the BRT. 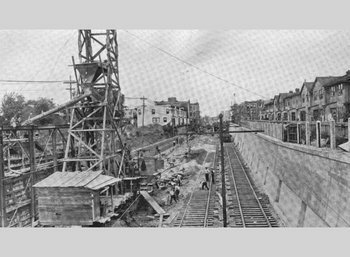 1913: Construction of Sea Beach Line under Dual Contracts begins. Junction with West End severed near 62nd St.
1915 22 June: 4 track open cut (current Sea Beach line) opens. 1923 15 June: Control transferred to BMT (New York Rapid Transit Corp). 1940 1 June: Unified into the New York City transit System. 1967: "NX" express debuts providing non-stop service between 59th St and Coney Island during rush hours. 1968: "NX" discontinued due to lack of ridership. The Coney Island-Stillwell Avenue terminal is the confluence of the four major BMT routes. The BMT Brighton Line, BMT Culver Line, BMT Sea Beach Line, and BMT West End Line all terminate/originate here. The station was a Dual Contracts-funded replacement for the private Culver and West End Depots. The station consists of four island platforms and eight tracks; from west to east (left to right if you're facing north), the platforms serve the West End, Culver, Sea Beach, and Brighton lines. Train access to the West End and Sea Beach platforms is from the north; Culver and Brighton from the south, although all tracks except those serving the West End platform pass through the station and can accept trains arriving from the north or south. Stillwell Avenue underwent a massive reconstruction and fully reopened serving all lines in May, 2005. During the construction one platform at a time was closed to service and the respective line was cut back to a temporary terminus or routed to a different platform than usual. The new station features an arched canopy over most of the length of the platforms (they are exposed at the north end). Under the canopy but over the platforms at about the midway point is a pedestrian overpass and crew quarters built on a bridge-like structure. This overpass is ADA-accessible via elevator. Ramps and stairways lead from the platforms down to the lobby area although the ramps themselves are not fully accessible, a short flight of stairs at the bottom of each one. The lobby area has the fare control turnstiles plus gates which are opened at times of peak traffic. There are ramps from the lobby to the bus lanes at the Mermaid Avenue end of the station. There is an old-style wooden token booth still used at this station at times of peak traffic. Stillwell Avenue offers many varied opportunities for photos and should not be missed. The north end of the station has a pedestrian crossing over all 8 tracks, and the view from the West End side looking north towards Manhattan is the best. The view south from the overpass is now obscured by the canopy but still provides excellent photo opportunities. Exit the station at Stillwell Avenue and yet more opportunities are available to you along Stillwell Avenue on the west, Surf Avenue on the south and Neptune Ave on the north sides of the station. 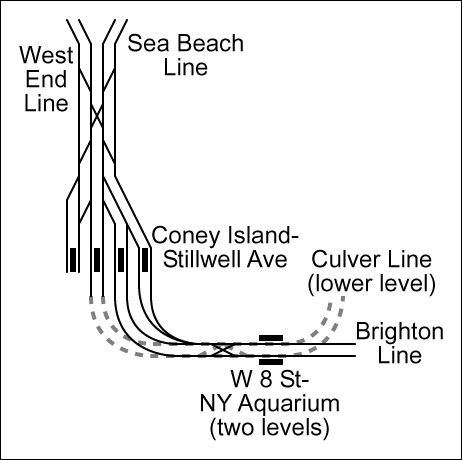 Track map of the Stillwell Avenue/Coney Island station area. This map has been released into the public domain by its creator, SPUI. Local station in open cut, with two side platforms alongside four tracks. The express trackways along this line are generally disused, and in most places, reduced to only one track. The express track can be used for bypassing work sites or testing of rolling stock. Typical of the stations on this line, it was constructed with an exit at both ends, with a street-level mezzanine and a single fare control allowing a free crossover between the two platforms. The south exit is now employee-access only. At track level, immediately south of the station begins the track work for access to the Coney Island Complex. Local station in open cut, with two side platforms alongside four tracks. The main exit at the south end leads to Avenue U, and a high-turnstile exit at the north end leads to Avenue T. Stairway configuration is slightly different here, with an intermediate level between platform and mezzanine. Local station in open cut, with two side platforms alongside four tracks. North of this station, the two express tracks are reduced to one. The main exit at the north end leads to Kings Highway, and a high-turnstile exit at the south end leads to Highlawn Ave.
Local station in open cut, with two side platforms alongside four tracks. Formerly known as 22nd Ave. Main exit at the north end leads to Bay Parkway; secondary exit at the south end to Avenue O. Mezzanines are carbon copies of the ones elsewhere on the line. Local station in open cut, with two side platforms alongside four tracks. The former Coney Island-bound express track is no longer in service. The station itself is not particularly remarkable, similar to stations found elsewhere on the line. There is a single exit to a headhouse at the south end. Local station in open cut, with two side platforms alongside four tracks. The former Coney Island-bound express track is no longer in service. Nothing remarkable, similar to stations found elsewhere on the line. There are two exits; the main one is at the south end, with a headhouse at the west side of 18th Avenue between 63rd and 64th Streets. North end has an unstaffed station house with HEET turnstiles, and is located at the west side of 17th Avenue between 63rd and 64th Streets. The station has typical north and south exits. A highlight of this station is the view of the BMT West End line crossing above us. Access to the West End line transfer is at the north end. Main exit to Ft. Hamilton Pkwy. is at the south end; the north exit leads to 11th Avenue. The east wall is concrete on the lower half with windscreen above. The west wall is all windscreen. Recently renovated. The LIRR Bay Ridge branch runs alongside the station on the north side. Main exit at the south end to 8th Avenue & 62nd Street, a typical station mezzanine like the others along the line. The platforms themselves are of quite a simpler construction that the other Sea Beach stations. At the north end of the southbound platform is a closed exit to West 8th Avenue, which has been grilled off for a long time and is now claimed by vines and weeds. The LIRR Bay Ridge branch crosses underneath and is visible from the north end. This crossing was called 'the Crossing' in the heyday years of the Bay Ridge line. North of the station is a switch plant connecting the sole remaining express track, and the right of way merges down to two tracks to proceed to 59th Street on the BMT 4th Avenue Line. Many photos, route descriptions, and details of the construction progress of the subway lines can be found in: Report of the Board of Rapid Transit Railroad Commissioners in the City of New York, for the year ending... 1901, 1902, 1903, 1904, 1905, 1906; and Report of the Public Service Commission for the First District of the State of New York, for the year ending... 1907, 1908, 1909, 1910, 1911, 1912, 1913, 1914, 1915, 1916, 1917, 1918, 1919, 1920. By Mark S. Feinman, Peggy Darlington, and David Pirmann.